I love the holidays. Bring on cheesy music, The Muppet’s Christmas Carol, and eating way too much homemade Almond Roca. The countdown to the holidays is the perfect time to enjoy some special Christmas activities with your family. Well it was in our house. Once I figured out how to simplify our holidays I finally had time to enjoy the days leading up to Christmas. 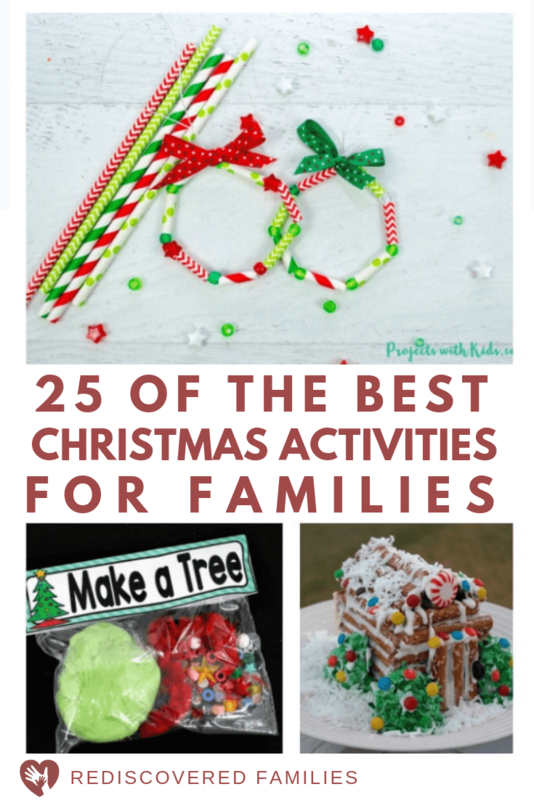 I’ve scoured the internet to find the best Christmas activities for families. If you are feeling overwhelmed, It doesn’t really matter what you do as long as you do it together. 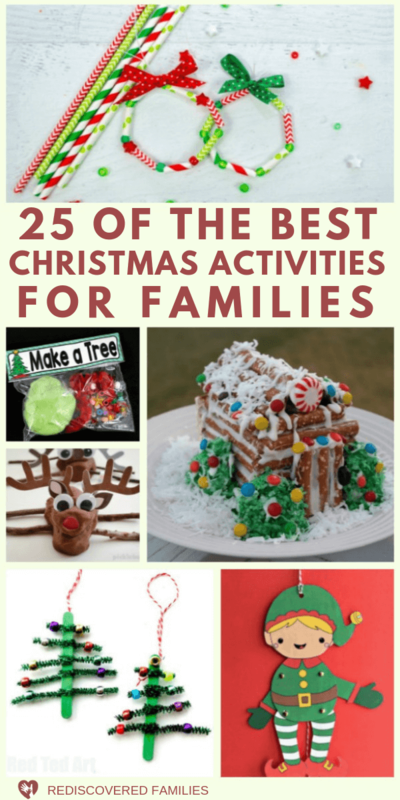 If you are looking for really simple Christmas activities try these 24 Simple Christmas Traditions for Families. 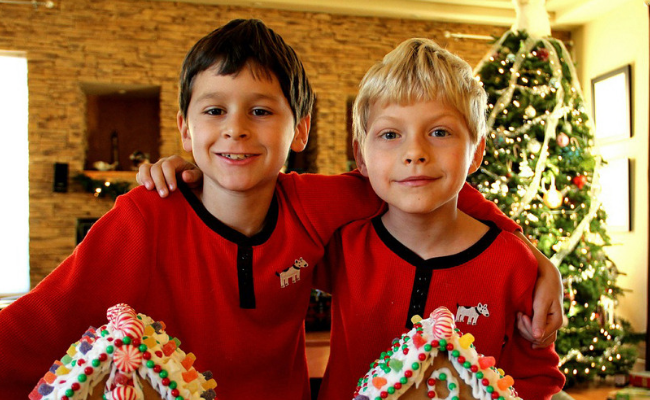 Making gingerbread was one of our favorite Christmas activities. This is something that continued for many years, even when the boys grew older. Sometimes we would have a party and each boy got to invite a friend. We used the recipe and instructions from Canadian Living Magazine. If you want to make things easy on yourself skip the gingerbread and use Graham Crackers or even pretzels. Making gifts together is a wonderful Christmas activity. One year we made cinnamon sugar to give to the boy’s teachers. It is super easy to do and was very much appreciated by the recipients. You can find an easy recipe here. Christmas can so easily become a gimme holiday. Some simple acts of kindness help shift the focus from getting to giving. YES! Something a little special: The Dating Divas have created a special movie night inspired by the movie The Polar Express—complete with (free!) printable “train tickets,” games, and yummy snacks and beverages. Get the details here. Make it super easy: Make some popcorn and put on your favorite holiday movies. Honestly your kids will enjoy it just the same either way. Grab/make some playdoh and a few supplies and let your kids go wild. Choose a Christmas audiobook and listen to it each night. My boys loved snuggling under blankets by the Christmas tree to hear the story. Audio books are a busy parent’s best friend. Your kids get to hear a wonderful story and you get to relax by the twinkling lights of the tree and cuddle with your kids. FANTASTIC. Bonus Activity: Make some really scrumptious hot chocolate or set up a hot chocolate bar. Get some AMAZING recipes here. What is your favorite activity at this time of year? Do you have any fun Christmas activities for families? What special family traditions do you enjoy? Thanks for the link! I love the snowman lunch too. Our family has almost too many fun traditions to count, but one of our favorites is our memory tree. On each vacation we collect an ornament. For each big event, like when our daughters danced in the Nutcracker Ballet, we collect an ornament. For things we always want to remember, like the births of our children, including our sweet stillborn baby, we collect an ornament. Then when we decorate our memory tree each year we share stories and memories of all our family’s history. I love the idea of the memory tree – sharing stories together is so important for families. I loved it when my parents did that with me. It gave me a sense of who I was and helped me understand that I belonged. My daughter is 25, and is coming home for Christmas this year. When I asked her if she wanted to do anything special, the answer was to make a gingerbread house. I would make the ginger bread, she would come up with the idea of the structure, and together we’d build it. Then she’d love to take the candies to decorate it. (We built a stable, castle, log house, even a working windmill) Then after it was all done, and it did its stint of decorating, we would take it to church for the kids to obliterate at coffee time. Good memories. I can’t wait to see what you make this time! What a great list of ideas to really make the holidays special! Thank you so much for linking up to Discover & Explore! I have started a tradition with my grandchildren making gingerbread houses. This will be our third year. The first year we made a traditional gingerbread house. Last year we made a gingerbread train. This year I got some cookie cutters from Ikea that make stand-up Christmas trees, stars and reindeer! We will also make a small cabin to complete the scene! It is a lot of fun and gets easier as the grandkids get older 7 years and 4 (almost 5) years old now! BTW – that picture of your boys is hilarious! I had three boys also and I have seen that kind of silliness before! Such joy! Oh I love this tradition! What a wonderful thing to do with your grandchildren! I loved having 3 boys, we had loads of silliness! Stopping by from the Family Friday linky. I like the idea of taking the family to a store and letting everyone choose a decoration. I’m going to try your gingerbread recipe! Mine hasn’t come out well the last couple times and it’s SO disappointing!